The tempest in a teapot about how much the looted artifacts are worth or whether they are the third or fourth largest source of revenue for ISIS should not distract us from the main point, made irrefutably by this gold-standard analysis of the hardest of hard data: market-driven looting of archaeological sites is rampant in Syria. What's needed most now, the next step, is not more argument about how much, but more clarity about where and how looted materials move from site to various destinations, through what exchanges, with what participants. That information in turn will help inform market design research by economists, by providing answers to such questions as: Where, if anywhere, are the most fragile links in the supply-chains? Where can leverage be most effectively brought to bear (for instance, by the US on emirates that are providing freeports for transiting illicit antiquities and enabling their own wealthy citizens to amass collections of illicit antiquities)? How can the various tools of governmental and intergovernmental action be used not to make these markets more efficient but to disrupt, cool, or smother them? This is the direction, at least, that we're trying to pursue more generally in the project now getting underway at Chicago, http://neubauercollegium.uchicago.edu/faculty/past_for_sale/. Protecting heritage in Mesopotamia Redux: Will the US military get it right this time? Bonnie Earnham (sic) of the World Monuments Fund proposed an even more radical step: incorporating heritage protection training into American efforts to train Syrian rebels and Iraqi military personnel. This is a very good idea in principle (and one that Bonnie Burnham may have proffered back in 2007-9 when she participated in the meetings that eventuated in the recommendations and articles, including one by her, in Antiquities under Siege: Cultural Heritage Protection after the Iraq War). As I have argued repeatedly, heritage protection -- especially in times of armed conflict -- needs to go beyond the valuable but insufficient focus on monitoring and conservation to also encompass the kind of expertise needed to secure sites from looters. Archaeologists and conservators simply do not know how to train military personnel in how best to deploy guards at archaeological sites, with what kinds of weaponry and other technologies, etc. In practice, however, it is far from clear that the American military has the kind of expertise in archaeological site security or antiquities policing to do much if any good. Military policing in general has never been a high priority of our military. On the other hand, it would take an incredibly tiny fraction of the American military budget to set up a heritage security unit better than any other military's. That's why in Antiquities under Siege we urged that the US do so. In the meanwhile, we also suggested, any military intervention by the US be planned with an eye to making use of the expertise of some of our allies in this area, notably Italy, Spain, and others. The State Department has issued a fact sheet related to Secretary Kerry's announcement of steps the US is taking in response to the destruction of cultural heritage in Syria and Iraq by ISIS. Those steps, Kerry said, included funding ASOR's documentation of conditions on sites and "doubling down on our support for Iraqi conservation experts and providing them with critical training on emergency documentation and disaster preparedness and response at the Iraqi Institute for the Conservation of Antiquities and Heritage." In Iraq, the United States government has provided nearly $33 million since 2003 for a broad range of cultural heritage projects, including infrastructure upgrades to the Iraq National Museum, establishment of a cultural heritage preservation training institute in Erbil, and site management planning and conservation work at the site of ancient Babylon. The Department of State also partnered with international organizations to develop the Emergency Red List of Iraqi Antiquities at Risk to enable customs officials to identify and detain objects from Iraq that are particularly at risk of looting, theft, and illicit trafficking. Since 1990, the United States has restricted the importation of cultural property of Iraq and other items of archaeological, historical, cultural, rare scientific or religious importance. Nor is there any mention of any of that $33 million going to pay for site guards or antiquities police. The vast majority of Iraq's archaeological sites were left unguarded for years, while millions were plowed into turning Babylon into an unvisitable tourist site for PR purposes, and millions more on training conservators. The latter is at least of some efficacy and worth funding, but we know that the few sites that have been spared have included those on which armed guards remained (including some in Syria in recent days) because they continued to be paid or had faith that they would eventually be paid by the archaeologists who had hired them as guards. Secretary of State Kerry's remarks contain no mention of restricting the import of cultural property from Syria, as was done for Iraqi material, and done not just for the importation of material into the US, but via UN Resolution 1483, on a worldwide basis. Why is the US not declaring an emergency ban for Syrian material itself, and why is the US not pushing through a worldwide ban at the UN? Would you rather be immersed online in the museum or in the world the work of art was plucked from for the museum? The British Museum is going to build a replica of itself inside the gaming world of Minecraft. That will, one assumes, permit visitors to go up to the artworks and look at them closely or even walk around them. Fine. But the major advantage of online environments is that one can immerse oneself and appreciate objects within their contexts, noticing how they are situated in relation to other objects, and how they are embedded in rituals, practices, whole ways of life that the game environment can reconstruct. Museums themselves are technologies designed sometimes to do something like this, but seldom in anything but a very piecework way, given the limits of acquisitions. The best we're likely to get is the museum director acting as cicerone talking to us as we look at the artifacts. But imagine, for example, that instead of a scholarly summary of the Parthenon marbles' role in ceremonies in ancient Athens, one could actually walk up to the Acropolis and participate in the ceremonies (of course there would probably need to be several versions, since we're still arguing about what went on up there). The British Museum would be much better advised to launch an initiative to put replicas of its artworks inside an online version of the original (or to be more specific, the most meaningful) locations from which those artworks were removed and brought to the Museum. For many artifacts, of course, this would be impossible given that they were looted and their context obliterated. But for many of the BM's holdings it would surely be fascinating to put them back in situ electronically, if arrangements could be made with the holders of other parts of the predella and the original church location, for instance, or with the holders of bits of the Parthenon marbles and the Greek authorities holding image rights to the Parthenon. First, it is wonderful that ASOR and others have succeeded in getting the administration to pay attention to the cultural disaster. Second, the conflation of looting with iconoclasm is troubling, because the two phenomena are driven by different motives and therefore require different policy responses. Third, and related to the conflation of looting with iconoclasm, there is no mention of any policy response beyond supporting documentation and conservation efforts -- both of these being laudable and useful things to do, but quite distinct from imposing international bans on antiquities trade, or beefing up INTERPOL and customs enforcement around the world to help enforce bans already in place, or calling on countries we know are conduits or important end-markets for these antiquities to tighten up, etc. etc. The Past for Sale: New Approaches to the Study of Archaeological Looting and the Illicit Trafficking of Antiquities is a three-year interdisciplinary project hosted by the University of Chicago. With major funding from the Neubauer Family Collegium for Culture and Society, the project brings together anthropologists, archaeologists, art historians, legal scholars, museum professionals, and social scientists in order to develop new ways of safeguarding archaeological sites, cultural heritage sites, and museums from looting and illicit collecting. Our aim is to advance both scholarly and policy goals. Our opening conference will address the topic of new approaches to archaeological looting. The ultimate aim of The Past for Sale is to generate new policy and conservation tools for the safeguarding of cultural heritage sites, archaeological sites, and artworks and artifacts. Along the way, we seek to clarify the grounds of inquiry. This includes definitional and methodological work, as well as empirical data. We are pleased to announce that Dr. Neil Brodie, co-director of the Trafficking Culture research center at the University of Glasgow, will present the keynote address on Saturday, February 28, 2015. Dr. Brodie is an internationally respected expert on the illicit trafficking of art and antiquities. How is the illicit trafficking of art and antiquities organized? local-level efforts to stop cultural looting and trafficking? – or only false promise -- to curb looting? Papers will be allocated 20-minute presentation slots as part of panels, with half an hour at the end of each panel for discussion. It is hoped that the conference will give rise to an edited volume of essays. Egypt announces it is developing a high-tech security system to monitor archaeological sites and museums. This is good news, though a better strategy might have been for Egypt to join forces with a number of other countries and approach MIT, Google, and other tech innovators to create next-generation monitoring designed for the special needs of protecting sites. Nord on Art points out that the e-catalogue for Christie's upcoming London antiquities sale includes a number of items lacking in the pre-1970s provenance that museums belong to the AAMD should require for any objects they acquire, and that makes buyers more vulnerable to potential repatriation claims. as the repatriation of antiquities continues to make international news, one wonders why any potential buyer would consider acquiring works without clear datable pre-1970 provenance. But there is really not much to wonder about here for two reasons. First, not all buyers care whether museums are some day going to be willing to accept donations of their artifacts. They are happy enough to acquire for themselves such beautiful objects, and perhaps eventually even display them in private museums; or they anticipate that eventually some solution to the problem of so-called "orphan" antiquities will be found and the very caring foster-parents who purchased these "orphans" will then be permitted to donate them. Second, the risk of having a repatriation claim brought is a calculated one for any buyer, and depends on several factors that may reduce it substantially: where the object's country of origin is difficult to establish that risk drops substantially, for instance, and the resources available to the country of origin are likely to be scarce, requiring them to focus on the highest-end objects and on repatriating items owned by countries, museums, or universities where leverage can be exerted in the form of threats to ban archaeological digs or exchanges. The continued saleability at auction of the kinds of items noted in the Nord post is only the tip of the iceberg. One can only imagine what goes on in the back rooms of antiquities dealers' shops where presumably the very highest-end provenance-challenged pieces are sold directly to collectors. But the key point here is that heritage protection advocates are deluding themselves if they think that the 1970 rule in itself is making much of a dent in the trade in non-archaeologically-excavated artifacts. Levi Keach, a graduate student at University of Nevada, Las Vegas and Iraq war veteran, has an ineresting post on the ASOR blog linking to a presentation he gave at the ASOR meeting. Keach reports on the results of his Freedom of Information Act requests for information about anything the military might have been doing on or around some major archaeological sites. The response he got was expectedly frustrating -- at least they got back to him (I'm still waiting for a response to my 2008 request), and the findings, also not unexpectedly, show no evidence that the military did nothing much to protect sites. There was, however, one puzzling set of slides included in the materials that the military eventually did provide Keach. 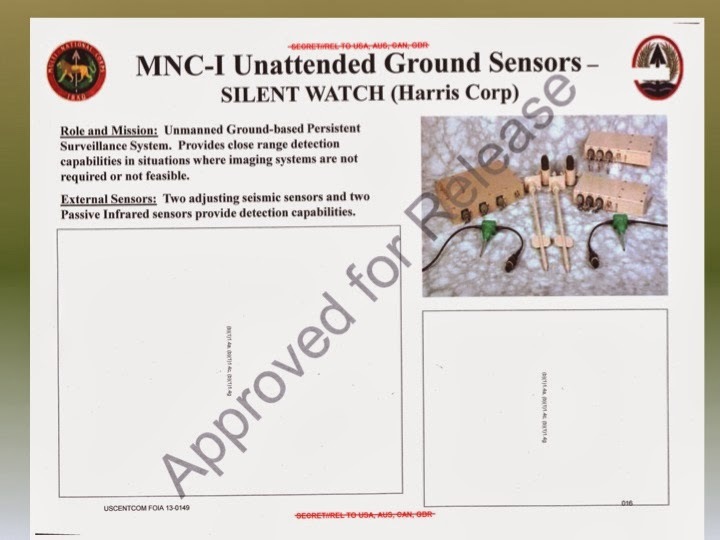 Several slides show remote ground vibration sensors. These were available at least as early as 2006. That they are included in the materials Keach requested might lead one to conclude that the military used remote sensing to monitor possible looting activity. Unfortunately, as Keach notes, the equipment appears to have been associated with the site (and therefore sent to him) only because there also was apparently insurgent activity in the area, including the burial of IEDs that seems to have been detected by the equipment. What can we conclude, albeit tentatively given the possibility that more information might eventually surface? 2. this equipment nonetheless was not deployed to protect archaeological sites, despite massive looting. Were the civil-military affairs officers advising these commanders aware that these technologies were available? If so, did they ever advise commanders it would be a good idea to use them? I am assuming the answer will be: "No, we were not aware -- but even if we had been aware that this equipment was available, it was not within our remit to hector commanders." Would that have been the attitude of the Monuments Men? Two Cheers for Interdiction and Restitution! A good post from Tess Davis following up on the Huffington Post piece she did with Mark Vlasic. I'd only add that while it is indeed laudable that the FBI et. al. are having some success nabbing individuals who are smuggling already looted artifacts, this doesn't really address the fundamental problem of how to prevent looting going forward, since the demand is global and effective interdiction difficult. Interdiction and restitution on a country-by-country basis, assisted by the always-understaffed INTERPOL, are necessary but not sufficient. And while it would be thrilling if the world could be persuaded to stand together and institute -- not to mention enforce -- a global ban on trade in antiquities, that is not going to happen. The real answer has to lie in providing more and better resources to those who are trying to guard and protect their own archaeological sites. There is, in fact, some reason to worry about the otherwise happy-making emphasis on high-profile seizures and restitution. Catching a few dealers here and giving stuff back might well be a policy substitute rather than a complement to developing policies that would actually protect the sites themselves. And there's good reason to believe that our government might prefer seizure and restitution to site protection support. That's because, as Davis and Vlasic note, restitution, with its high-profile newsworthiness, is a handy tool for mending diplomatic fences, much sexier than, say, giving some remote sensing devices to the Cambodian antiquities police. Just as in Iraq, where Babylon was restored while thousands of sites were left unprotected, so more generally, splashy seizures may just mystify and obscure negligence about the real and more intractable issue, which is how to keep the looters from reducing sites to rubble in the first place. I had begun reading this story, titled "Iraq Unveils Restoration Plan for Heritage Sites", prepared to be disappointed at another instance in which the focus was being placed on maintenance maintenance and tourist infrastructure rather than on protecting sites against looting. As usual, I thought, the World Heritage Site prize is skewing priorities. Another project aimed at protecting archaeological sites involves installing ground sensors around each site to detect and monitor movement and transmit it to specialised offices and security services via satellite, Saleh said. "This project, which we hope to launch this year, is among the most important to help curtail random excavation by antiquities thieves at archaeological sites that do not have sufficient protection," he said. "This in turn protects the human and cultural heritage of Iraq against theft and smuggling," he added. The use of remote monitoring technology to enable antiquities police to detect looting is something that we've been calling for since at least 2007 (see the suggestions collated in Antiquities Under Siege: Cultural Heritage Protection after the Iraq War). To my knowledge it has not been done elsewhere. There are of course GIS mapping projects and tracking via satellite imagery, but neither of these involves ground sensors and imagery collection and analysis is much too slow to be of great help, whereas one assumes that the ground sensors will stream real-time information. We need to know to be sure, but this Iraqi initiative could be a gamechanger. First, "only stupid people get caught." Clearly this statement must be taken with a grain of salt, reflecting some bluster here on the part of the dealer (and in talking to the press at all the dealer is already showing some lack of discretion). On the other hand, that he feels he can get away with talking to the press -- and even allowing Al Arabiya to film his stock! -- shows how unafraid of getting caught dealers can be. Second, the risk of getting caught and the consequent costs of selling clandestinely are carried by the seller: "The trader, who allowed Al Arabiya to film his stock of illegal artifacts on sale, said every smuggled artifact loses about 70 percent of its value" -- presumably compared to what it would be worth to the dealer if the artifact were licit. And yet even with this markdown the dealer still finds it worth selling. Third, the illicit market continues to function, despite lower profitability, not just in normal times but in the special conditions of a glut caused by the breakdown of site security and consequent looting of Egyptian sites: 'An artifact like this one, which I sell now for $718 used to be worth $7186, and it wasn’t easy to find such a piece. '” Prices for illicit antiquities have dropped by 90% - and yet the dealer continues to deal. Presumably the illicit $7000 piece would have been worth $23000 if licit, so the collector now can buy for $700 a piece that might someday or even today if he/she can get away with selling it as licit be worth thirty times its purchase price. Metal detecting is supposedly illegal in Egypt without a permit, by the way.